Jijai, S., Srisuwan, G., O-Thong, S., Norli, I., Siripatana (Thail, C. (2016). Effect of Substrate and Granules/Inocula Sizes on Biochemical Methane Potential and Methane Kinetics. Iranian Journal of Energy and Environment; previously called: Iranica Journal of Energy & Environment, 7(2), -. S. Jijai; G. Srisuwan; S. O-Thong; I. Norli; C. Siripatana (Thail. "Effect of Substrate and Granules/Inocula Sizes on Biochemical Methane Potential and Methane Kinetics". 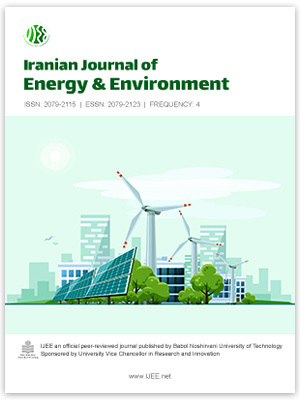 Iranian Journal of Energy and Environment; previously called: Iranica Journal of Energy & Environment, 7, 2, 2016, -. Jijai, S., Srisuwan, G., O-Thong, S., Norli, I., Siripatana (Thail, C. (2016). 'Effect of Substrate and Granules/Inocula Sizes on Biochemical Methane Potential and Methane Kinetics', Iranian Journal of Energy and Environment; previously called: Iranica Journal of Energy & Environment, 7(2), pp. -. Jijai, S., Srisuwan, G., O-Thong, S., Norli, I., Siripatana (Thail, C. Effect of Substrate and Granules/Inocula Sizes on Biochemical Methane Potential and Methane Kinetics. Iranian Journal of Energy and Environment; previously called: Iranica Journal of Energy & Environment, 2016; 7(2): -.